A tingling sensation on your teeth can certainly be an indication of tooth sensitivity which is also termed as dentin hypersensitivity. There could be many factors which can lead to such dental conditions and getting it treated at the right time can help heal the discomfort. Your teeth can get sensitive when the dentin which is yellow in color and lies beneath your enamel gets exposed. Dentin consists of many microscopic tubules and when they come in contact with anything hot or cold, the sensation reaches to the nerves inside the tooth. Today, we have discussed some of the causes of dentin hypersensitivity which are given below. A Cracked Tooth: A cracked tooth can expose the nerves situated inside your tooth which may result in increased dentin hypersensitivity. This may also lead to difficulties while chewing your food. The severity of the cracked tooth can worsen if you ignore its condition. When You Experience Gum Recession: Gum recession is one of the most alarming signs of gum disease and you may experience tooth sensitivity if your gums start to recede. The dentin might get exposed due to this condition which will certainly lead to sensitive teeth. A proper dental hygiene can help prevent gum recession. Plaque Buildup: Plaque can get accumulated around the gum line due to poor oral hygiene. The sticky film consists of bacteria which can wear down the enamel and lead to dentin hypersensitivity. Plaque buildup can not only cause tooth sensitivity, but can also trigger several other oral problems. Thus, make sure you floss between your teeth every day to remove the trapped debris. Aggressive Brushing: Brushing your teeth vigorously will certainly affect your enamel and cause sensitive teeth. Therefore, it is necessary to know the proper technique of brushing. Also, use a soft-bristled toothbrush to avoid abrasion. 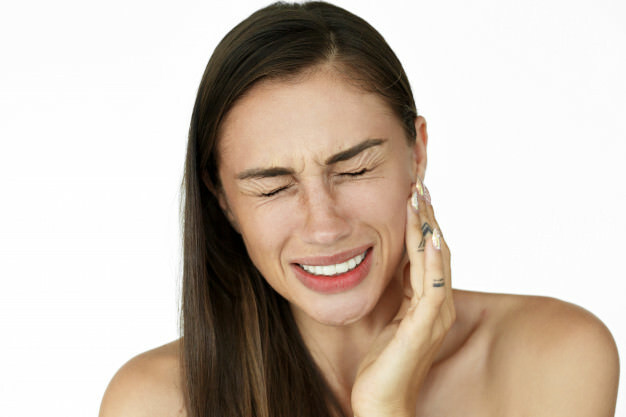 When You Grind Your Teeth: Bruxism or teeth grinding is one of the major causes of dentin hypersensitivity. Your tooth enamel is quite strong, but it can wear down if you clench or grind your teeth. People mostly experience bruxism while sleeping. Consult a dentist right away if your head aches after waking up or if your jaw muscles and face pains as these are the symptoms of teeth grinding. Are you experiencing sensitive teeth? Call Smile Avenue Family Dentistry today at (832) 648-1756 to get the condition treated. Our dental office is located at 9212 Fry Road, Suite 120 Cypress TX 77433.